less is more: & he's gone. Another airport drop off yesterday, another teary goodbye, and another car ride home spent trying to stifle the sobs. After every one of these trips to the airport I feel a little bit emptier inside than I did the last time. With every drop off and additional time spent apart I get less sad and more angry that it has to be the way it is. And knowing that the result of this drop off is another full year apart just makes me sick to my stomach. An entire year. 365 days of "I miss you"s - exactly what I didn't want after hitting our five year milestone last month. In this next year it is in my estimation that we'll spend about sixty three days together (most of which one of us will spend waiting for the other to get home from work at the end of the day to spend a few hours with before they pass out). That's 17% of the year at best. The other 83% of my year will be spent attached to my iPhone, waiting for an opportunity to FaceTime, iMessaging the crap out of my data plan, and wondering why I'm going home to my parents instead of the guy I love. These past four weeks weren't ideal what with me working full time and R being stuck at home waiting for me (not to mention sleeping in my full size bed with Lucas at the foot of it every night), but they were good and they went as fast as they always do because our time spent together is so seamless and easy. This past Friday Rich came to work with me and it was just such a picture of my future life. 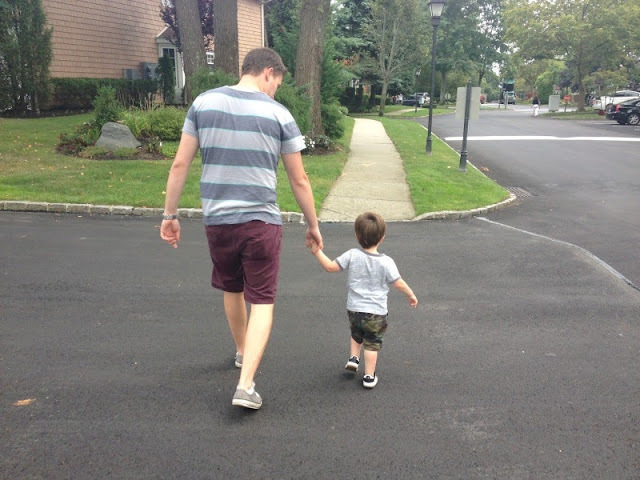 I've seen him with kids before, but seeing him with Max, a kid who I am so in love with and spend so much of my time with, made it so much harder for me to have to say goodbye to him. I want to be spending my spare time apartment shopping and talking about the future, not retreating to my parents house boyfriendless while R flies 3,500 miles away from me. I'm more determined than ever to move out on my own and hope that at the end of this year R can follow me wherever I go. For now, I'm still finding myself as a long distance relationship connoisseur, something that I hope will change after a few years of normalcy. I'll get back to you then I guess.